Runfeng's fitout is fairly slick as far as food court stalls go, it's clean, uncluttered and confident. When we quizzed the super friendly and helpful stall holders we found out the name comes from a harvest festival, a celebration, and the explanation on the wall of what dumplings represent is a nice touch which echoes this idea. 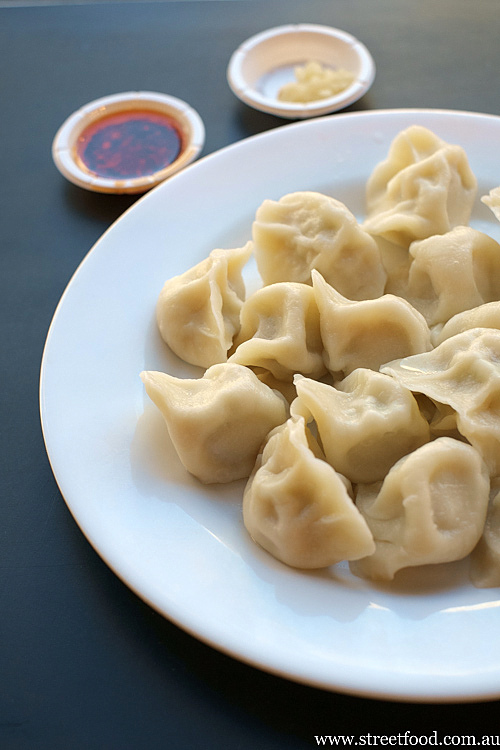 The menu is as as simple as it gets: dumplings and steamed buns. Everybody loves dumplings, even fussy girly girls on diets, so Runfeng might be on to a good thing here. We're interested to see if a stall can survive on dumplings alone. We hope so. #7 - Pork, small dried shrimps, bok choy and Chinese chives - $5 for a half serve of eight pieces (or $8.99 for 16). 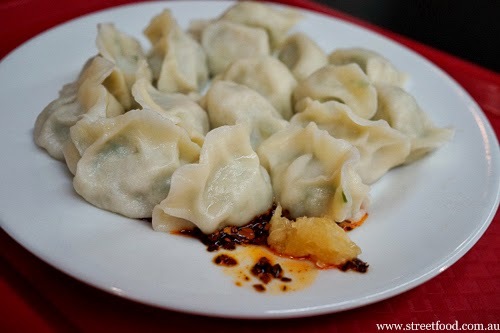 We're not dumpling experts but these tasted pretty good to us, much like the classic pork'n'chive dumpling. The taste goes to another level when you dunk them in crushed garlic and chili oil, self serve at the counter. #8 - Fish and Chinese Chives - $6.40 for a half serve of eight pieces (or $12.80 for 16 pieces). Lovely, lively fresh fishy flavours, Mr Shawn doesn't usually get excited about dumplings but these had him skipping all the way home. 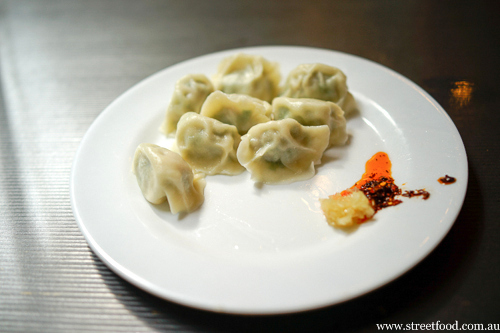 We try those fish and Chinese chive dumplings again, they're just as good the second time. 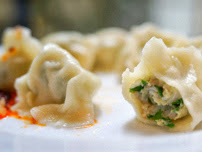 We also try pork and fennel dumplings which are amazing. They were mixed together on the one plate, a dumpling roulette of tastes. There's a number of changing specials available, we saw pork belly and cauliflower listed. There's even a few free samples if you hit the stall at the right time. They will pan fry the dumplings for you too. The steamed buns weren't available when we went, we will try and get to them later. Had to come back and try the pork belly and cauliflower dumplings ($12 for 16 pieces). These were pretty good, they taste like pork dumplings. 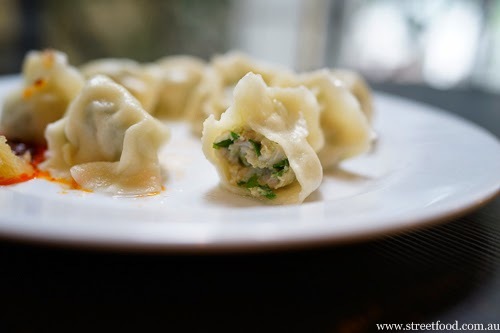 The fish and Chinese chives dumplings are still the standout for us. 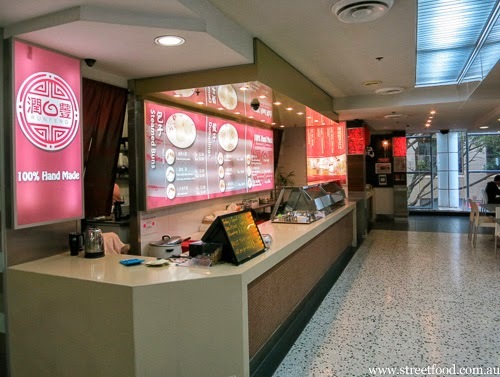 Runfeng Dumplings is in the Sussex Centre Food Court, up the escalators at 401 Sussex Street, Chinatown. this food court is full of little hidden gems! I tried the beef and celery dumplings yesterday and they were excellent. Looking forward to trying all the others!